SCVHistory.com FF8301 | Tataviam Culture | Mary Louise & Harold Romero Family Outing, Frazier Park ~1983. At right: Mary Louise Garcia Romero (Feb. 16, 1928 - May 12, 1999) and her husband Harold Ernest "Sonny" Romero. 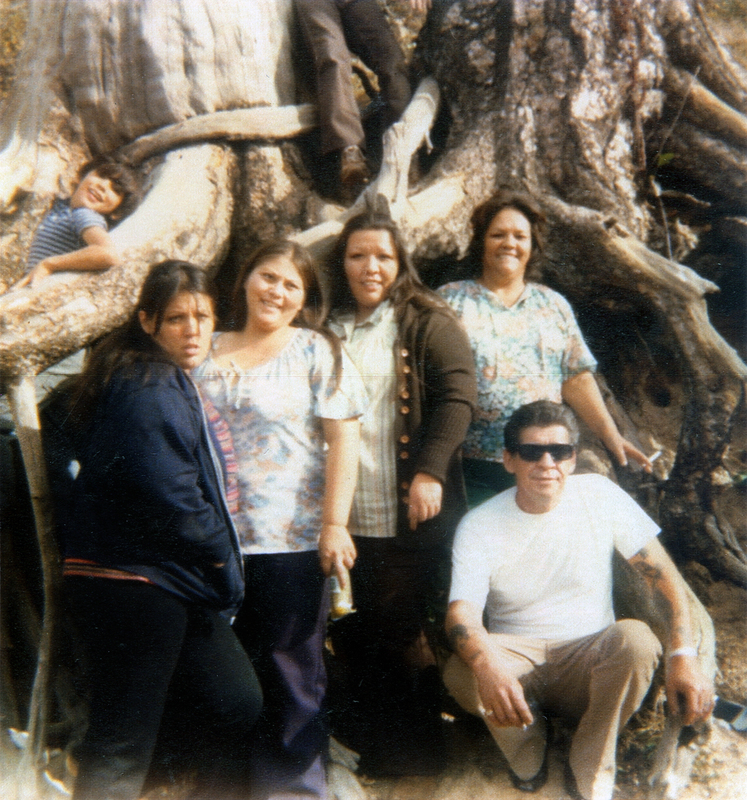 From left: Ernest Tristan (in roots of tree), Ernestine Louise Romero Casarez (Oct. 23, 1949 - Dec. 4, 2009), Joanne Jane Romero (Feb. 20, 1956 - June 14, 1984), Eleanor Marie Romero (March 14, 1946 - Feb. 28, 2009). Ernestine, Joanne and Eleanor are daughters of Mary Louise and Harold Romero. Ernest Tristan is the second son of Ernestine. According to Geraldine Romero Perez (not shown), this is probably Frazier Park. Mary Louise Garcia (Romero) is a daughter of Chief Mary Cooke Garcia (1901-1975), whose ancestry can be traced to individuals who lived in the Santa Clarita Valley prior to European contact in 1769. FF8301: 9600 dpi jpeg from photograph courtesy of Geraldine Romero Perez.